A new four-year cycle of “Study Days” started in 2017. 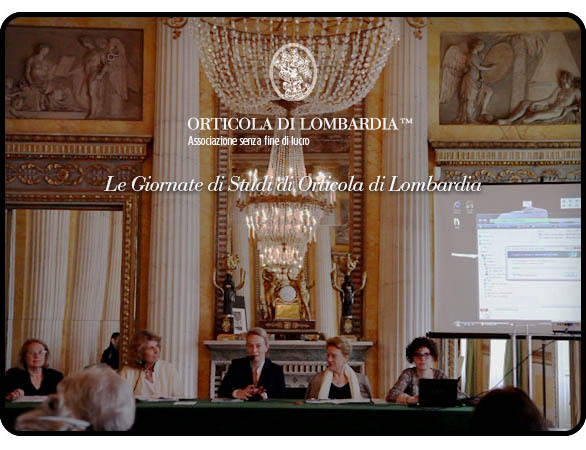 The next meetings program conducted by Filippo Pizzoni and Margherita Lombardi for Orticola di Lombardia will take place in the spring 2019. 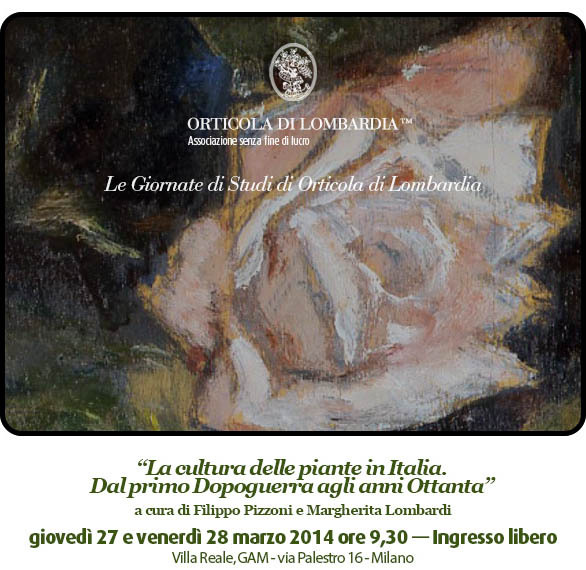 “GAM”, the Modern Art Gallery in Milan hosts “The Study Days” of the Lombard Horticultural Society, a philanthropic event for the benefit of the Milanese community to share knowledge and significant data from the history of plant culture in Lombardy and Italy. Free admission for everyone. The culture of plants and gardening has deep roots in our country, due to historic, artistic and natural contributing factors, which have witnessed the development of a great agricultural tradition in Italy, and the creation of an incredible historic artistic garden heritage, the destination of cultured tourism, with important botanical collections and excellent horticultural production highly esteemed worldwide. The multi-disciplinary approach in fact aims to stimulate dialogue between different experiences and fields of study, which help to understand the evolution of such an important part of Italian culture, to analyse as many aspects as possible in order to formulate a general picture, with the aid of historic documents and works of art present in the rich heritage of civic collections. The Study Days are aimed at students, professionals in the field, enthusiasts and scholars of the various disciplines to stimulate an exchange between different fields of knowledge, which help in understanding better the evolution of plant culture in Italy. Beginning with pre-unification Lombardy, the first edition dealt with the passage from Enlightenment encyclopaedic culture to the scientific and pragmatic aspect. The introduction of an infinity of new plants and the fashion stemming from beyond the Alps showed a new way of making gardens while in Milan the first interventions in the city landscape were conceived in an environment distinguished by such impassioned botanists as Luigi Sacco, Luigi Castiglioni, Ercole Silva and Alessandro Manzoni. Plant culture developed during this time of great revival between the Unification of Italy and the first world war: many new public parks and gardens were conceived with backup from the important journeys of plant hunters, while professional horticultural production was established and important associations and publications flourished. A constantly growing interest is reflected in all the artistic forms, and the great botanical passion of Giuseppe Verdi, an expert gardener on his property at Sant’Agata, was celebrated during the bicentenary of his birth. The leading figure of the time immediately after the first world war was Gabriele D’Annunzio who described plants with the accuracy of an expert in his writings. This period witnessed the revival of the so-called Italian style while, after the second world war, Italy produced a landscape designer of international calibre: Pietro Porcinai. Private gardens began to open to the public in the 1950s and flowers and plants began to inspire fashion. This crescendo culminated in the 1980s, when discussions on plants and gardens resurfaced in the work of Ippolito Pizzetti and specialised publications. The latest edition of this four year programme deals with the many themes that consider plant culture to be a very fashionable topic since the end of the 1980s. Which are the new professions linked to plants? What are the risks of globalisation? Which are the topics of urban horticulture and communications in the field? Which are the new leanings in the management of historic gardens or the design of urban parks? Three days of meetings and talks with the greatest experts in the sector to answer all these questions, and sum up the state of the art of green culture in Italy and look into the future that we can only surmise. The people: academics and scholars, enthusiasts and amateurs. 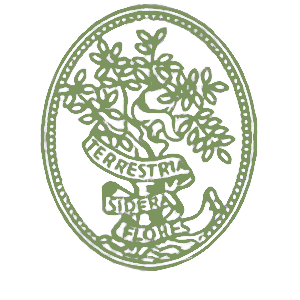 Artists and men of letters committed to the culture of plants and gardens. Schools teaching horticulture, gardening and landscape. Open-air events, festivals and shows. From horticultural shows to show markets. Literature and manuals on horticulture and agronomy. Portrayals in major and minor arts and popular iconography. — The native of Roncole. 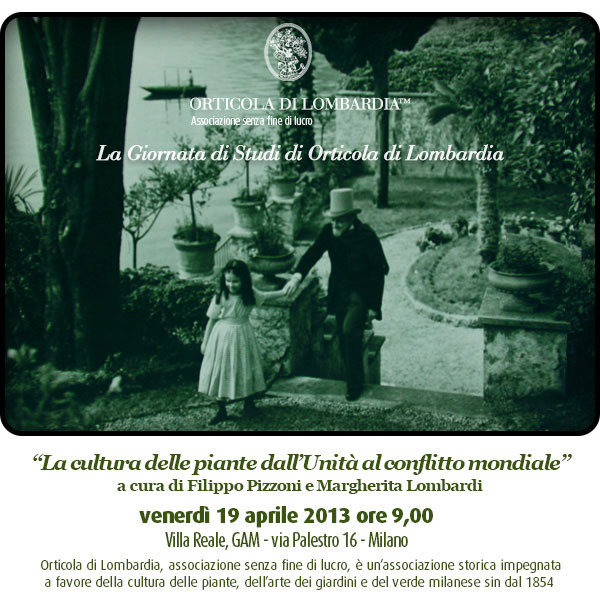 — Cecil Pinsent and Italian gardens in the XXth century: revival or new style? — Orticola in the city. Luisa Toeschi, President Italia Nostra Northern Milan. Enrico Banfi, former Director of the Milan Natural History Museum. 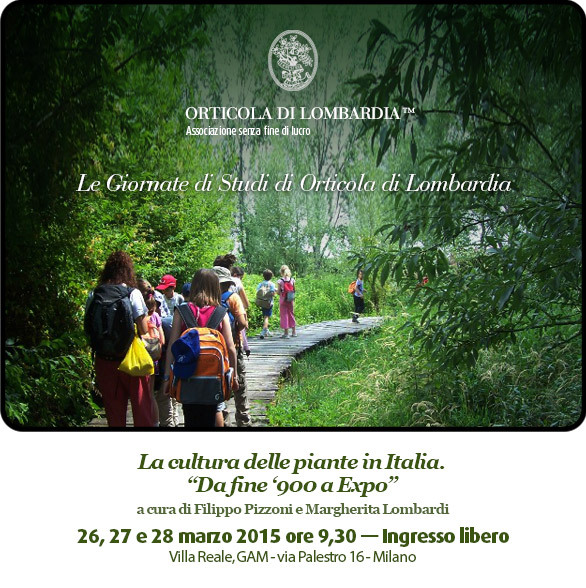 Marco Fabbri, President of the Association of Agronomists and Foresters in Milan. Francesca Marzotto Caotorta, garden designer and writer. Giorgio Galletti, former Superintendent of Florentine Architectural heritage. Lauro Marchetti, Director of the Ninfa Garden Natural Monument. Laura Sabrina Pelissetti, President of Regis, the Historic Gardens Network. Gianfranco Giustina, Curator of the gardens on the Borromean Islands. 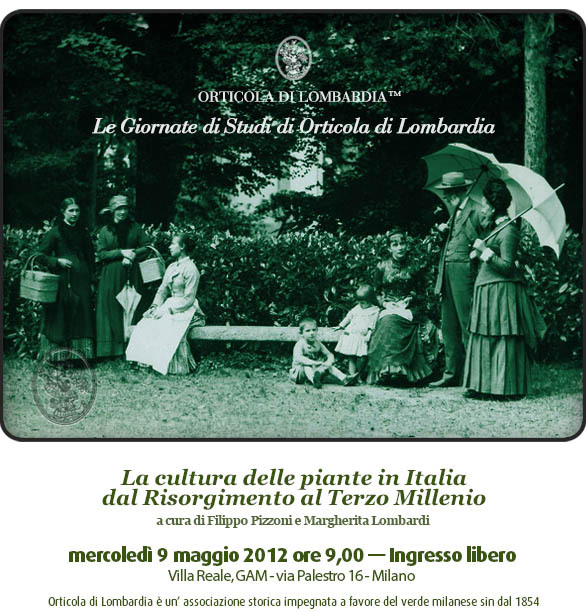 Filippo Pizzoni, Lombard Horticultural Society. — Why do Italians hate trees? Francesco Ferrini, Italian Arboriculture Society. Donato Chiatantea, Università degli Studi dell’Insubri. Elisabetta Margheriti, Commercial Director Torsanlorenzo Gruppo Florovivaistico. Francesco Mati, President of the National Floriculture Federation, Confagricoltura. Giovanni Sala, Councillor of the Associazione 100 Cascine (100 Farms Association). Paola Longo and Salvatore Laforgia, Filmmakers. Anna Lambertini, limes landscape architecture. Luigi Latini, IUAV University Venice. Matilde Marazzi, Alessandro Ferrari, AIAPP Lombardy. — The agronomist’s job. In the city! Laura Gatti, Università degli Studi, Milan.